Buy online LevelLite 30 lb. Self-Leveling Underlayment LLSLU30 and leave review or share with Your friends. 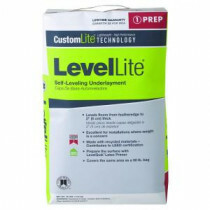 LevelLite Self-Leveling Underlayment helps level floors prior to the installation of ceramic tile, natural stone, resilient flooring, carpet, wood and other floor coverings. This quick-setting underlayment can be applied to 2 in. (5 cm) thick in one pour and seeks its own level in minutes. With proper installation, the use of LevelLite can achieve an extra heavy rating for high impact use in food plants, dairies, breweries and kitchens.